As long as we’re looking for something outside of our own inner landscape to complete, validate, or otherwise be the maker of our sorrow and/or happiness, we will continue to suffer. And suffer we will – for the rest of our days. What praise and blame have in common is that they help perpetuate the illusion that other people’s actions and words are what determine our quality of life. We are often dependent on others to both build up and maintain our self-worth and value and take the fall for any amount of discomfort or discontent we experience. We are continually putting our state of mental and emotional well-being in the hands of those around us. I’ve recently taken to watching old episodes of Northern Exposure on Youtube. If you’re not familiar with the show it lasted for 6 seasons and aired in the early 90’s. It’s set in a rural Alaskan town that has less then 900 people in it and features a variety of eccentric characters. It has native american themes coursing through many of the episodes and I appreciate the lessons and insights that are often interwoven into the show. A few days ago I watched an episode where one of the main actors, a half-white half-native american named Ed who’s in his early 20’s, was grappling with whether he wanted to follow the calling he had received to become a shaman (also known as a healer). He was being followed by a small leprechaun type of creature with red glimmering eyes who tried to convince Ed that he wasn’t good enough to go out with this certain girl he had met. It was later explained to Ed, by his shaman mentor, that every healer in training had their shadows or demons to deal with and the leprechaun was his. He further explained that his demon was the worst of the differing kinds because it was the demon of self-doubt and it would be the hardest to cast away. He said that Ed might deal with that demon all his life but that he could keep it at bay by working on his self-confidence and learning how to love and accept himself. Ed’s mentor basically stated that all suffering that exists in the world is due to low self-esteem. He asked Ed the rhetorical question, “Do you think Hitler felt good about himself?” In his explanation I heard a very similar parallel teaching within my own mindfulness tradition that states how people with that much anger have a great deal of suffering and will cause others to suffer too. As I am interested in becoming a dharma teacher in my Buddhist lineage I am on the path of learning how to piece teachings together, observe how others teach, look for ways to unfold habit energies, and discover the roots of suffering for myself in order to offer support to others. 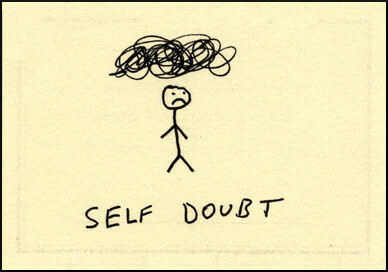 I started thinking about the shaman mentor’s notion of how all suffering is born from low self-esteem and self-doubt. It made sense to me.